Digital nail art machines function as printers to print imaginative and decorative designs on your or your customers' fingernails (Source). Digital nail art machines come with hundreds or even thousands of pre-loaded designs, with the added ability to customize your own (Source). Essentially whatever you wish to print, can be imprinted on the nail. Nail fashion technology is an emerging industry trend in nail care salons across the world. With the ability to print high-quality images with pure photographic clarity right onto artificial or natural nails in seconds, it is a smart way of monetizing your nail salon with a new and exciting product offering. This particular unit unites printing technology and nail art. It makes it possible for the nail printer to print any pictures even your photos onto fingernails. The machine is controlled by O'2nails APP through WIFI, the APP is free and available for both iPhone and Andriod smartphones. One buyer we spoke with told us that they bought it to add to their salon as an extra money-maker. She used the app to work the unit and told us that it was fairly user-friendly and easy to work. The only downside is that their is a bit of a learning curve, so if you don't have the time or inclination to fully learn how to use the machine it might not be a good investment. This used to be one of our favorite options, but we've seen it become unavailable on a lot of our favorite eCommerce sites. Buyers say that while it is not ultra-simple to use for photo-quality nail printing, eventually they got the hang of it. The manufacturer also says that it enables you to print any word or picture onto your nails, including colors- you will have to replenish the printing oil from time to time, however. Nail printers: fad or here to stay? If you run a nail art salon you are well aware that it is imperative to stay up-to-date on the latest trends in nail art. More and more customers are demanding that nail salons apply interesting and artistic designs to their fingernails. In essence, the fingernail is the canvas for the nail technician to print beautiful and artistic images onto the surface that complement the client's physique and style. It is common practice that nail art salons provide overlapping services that you traditionally find in standard salons. For instance both usually specialize in manicures, cuticle trimming, nail polishing, and specialized hand cream lotion. Higher-end services can include custom consultations that focus in on designing longer-lasting artwork for fingernails that a customer can return on a weekly or biweekly basis to have updated and redesigned. The types of nail art services that your particular nail salon offers will probably vary by what area of the country that you live in. In New York City, for example, you can't walk down the block without passing several nail salons, it seems like. What's inside a digital nail art printer? While if you are in a place like Wyoming you may only find one nail salon, that is pretty uninspired, inside of a small town. Nail printing machines are a way of cutting down costs and automating the process of designing artistic and photo-realistic nail designs onto real and fake fingernails. In many salons, you will find nail technicians who actually handpaint each fingernail- this can take an extremely long time and be pretty expensive to both the customer and the nail salon employer. Nail printing machines are a convenient and cost-effective way of addressing the situation. You can pretty quickly accommodate any customer- offering them a range of template designs as well as customization options, and then handle five fingers or toes at a time. 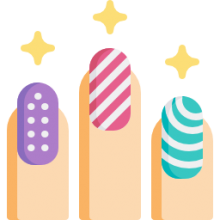 If you are unable to afford a nail printing machine, you can check into nail art stickers-in this case glitter or stickers are affixed to the fingernails. If the nail technician has poise and skill they can affix these design elements directly onto the fingernail pretty quickly. It's important to understand that these differ from the output of nail printing machines which are longer-lasting and actually print onto the nail rather than adhere to it. If you're looking to purchase a nail printing machine, check out the comparison table above. It's important to note that you can return your nail printing machine so when you check out the product pages make sure you understand the warranty information. The nail printing machine can be an excellent investment for a nail salon looking to monetize their business and also an exceptional service that is almost fully automated for customers to self manage their own nail printing art.